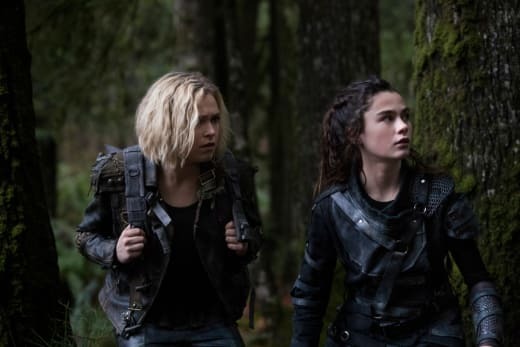 We left off The 100 Season 5 Episode 9 with Bellamy, Indra, and Gaia making a choice to turn Madi into a Commander. They offered her the flame and because of that put themselves at risk when it came to both Clarke and Octavia. Clarke partnered up with Octavia briefly so that she could leave with Madi, leaving Bellamy and Indra and Gaia to die. From there, Octavia decided to inflict the maximum punishment in the bunker by forcing the three to fight it out to the death, with her showing a hint of emotion to that very decision behind closed doors. Meanwhile, in Eden, a riot broke out that separated Charmaine and McCreary's factions, with Abby getting caught in the middle when she was taken. Now The 100 Season 5 Episode 10 is using the title "The Warriors Will," and chances are no one is going to come out of this episode the same way that they went into it. Death is looming over several characters, and the others are in their usual amount of danger in scattered parts of the story. There will obviously be a lot at risk with Bellamy, Gaia, and Indra having to fight it out in the pits, all while Clarke and Madi presumably make their way to a wrecked Eden. The synopsis for this specific episode is, "Monty strives to show Wonkru an alternative to war, and to the valley itself. Meanwhile, Abby's health continues to deteriorate, along with McCreary's patience." There is also this very helpful trailer to help arrange our expectations. This preview may contain some light teases about the tenth episode, all of which are based on characters and scenes that have been discussed before or have been included in promotional videos and/or photos. Proceed with caution if you don't want speculation or a variety of theories, but really, who doesn't like that? There is the most information about this portion of the episode, and yet there is no way to tell where any of this will go. 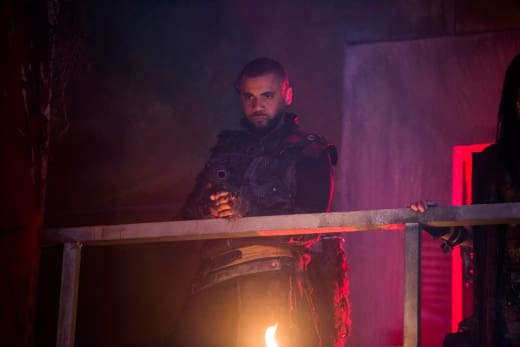 Bellamy, Indra, and Gaia have been sentenced to the worst punishment that the bunker allows and Octavia doesn't seem to have any plans to intervene. As mentioned before, Octavia may show signs of emotion and doubt about how far she has pushed things, yet that doesn't mean she will allow that moment to dictate her next steps. She has arguably the three closest people in her life all working against her, and instead of asking why that may be happening she chooses to just have them all fight to the death until one remains standing. Based on the trailer for the episode, fighting is exactly what they do, with Bellamy and Indra specifically having multiple actions shots. There is also one specific shoot that has Gaia on the ground passed out, a possible hint that she dies first. This hint isn't one that should be considered trustworthy, if only because that is then a big spoiler that got released and that gives away part of the story that I don't consider possible. Still, the chances of Gaia being the one that doesn't make it out of their alive is higher than the rest. When considering the character death watch for this season, Gaia is a character that is most at risk because of outside casting confirmations and the smallest amount of involvement in the overall arc. And yet the idea of this being the end to Gaia is unimaginable, partly because she is such a presence within the show. Trying to conclude who could be the one to take Gaia out is even worse, with either Indra having to make that horrible choice that really wouldn't make sense of Bellamy being written into a role that he truly doesn't fit into. Bellamy spent the last six years reconstructing his definition of a true leader, and that included taking a more practical approach that involves words more than it involves action. There is also just the obvious point that Bellamy wasn't in the bunker so chances are he will be the one most likely not willing to partake in this mess. He disagrees with it as a concept and he wouldn't be willing to kill anyone, even if he was put in this situation by his sister. Especially because he was put into this situation by his sister, that is more of a sign that Bellamy will be the hardest to force to do this because he disagreed from the beginning and he isn't part of Wonkru. The act of submission is a big one to consider, with Indra most likely willing to give into the ways of the fighting pits because of her sense of duty. Still, even based off the trailer, there is no way that that pit sees multiple deaths. Bellamy is a guaranteed survivor, and Indra is a very strong second, with Gaia possibly being able to make it out alive as well but also having the bests chance of being the victim of a shocking twist. Monty and Harper may not have been around during the most chaotic of moments, with a possibility that they will represent the coming back and everything being on fire meme. There must have been progress made on the algae side of things, with Monty ready to show an example of a way that they can stay in the bunker and not worry about sustaining themselves for the rest of time. The problem with that includes the literal death show that is about to go down and the fact that Wonkru (or specifically Octavia) may not be willing to hear him out. The issue with the algae supplying food for them means Octavia will have to surrender a plan to march to war, something she won't budge on. The bigger issue is what the topic of algae will create, specifically the fact that Bellamy used some of it to poison her and possibly the past way that Wonkru had to look after themselves when they may not have had the food they needed. The idea of once again maybe not having access to constant food will create more of a fire within the group to get to the valley where this will no longer be a problem. It sounds like The Dark Year will be a narrative told from Abby's point in view in the next episode, but there is no way that it won't reflect on what Octavia had to do during that time. 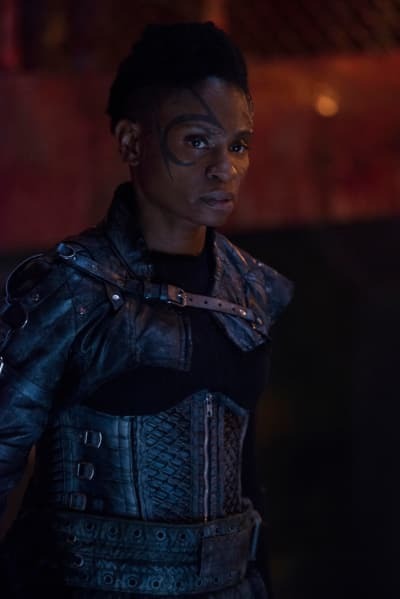 During The 100 Season 5 Episode 9, there was a scene between Indra and Octavia that again touched upon the heavy choices that Octavia had to make so everyone could survive. Even after all those times, it all weighs on her and the decisions that she chooses to make. If Monty's plan to survive in the bunker triggers any fears that Octavia still connects to that year, there is no chance that she will agree or allow anyone to see his idea through. There really is a limited amount that can be said about Monty's journey to change Wonkru's mind, mostly because the only promotional information that was shared so far was the trailer that is filled with only the pits. The questions that should be asked then is where does Monty find the time to propose all this? Does he suggest it to Octavia and the others before she begins the deadliest games that are about to happen in that arena? Or will this problem solver come up after this fight finds some sort of end? There is obviously no way that two of the three people will die so something must stop it, whether it is Octavia or the victims or even Monty bursting in because Harper and he weren't even aware that this was going on. 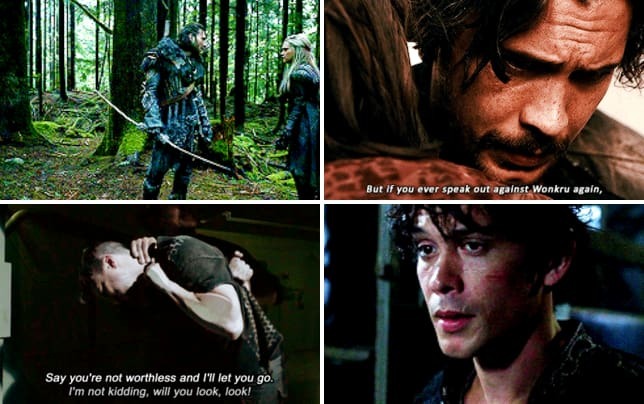 It will be a painfully nostalgic look at Monty's reaction to this nonetheless, with The 100 Season 5 Episode 8 marking a glimpse into just how much he is suffering from all this death and destruction again. This story is more likely to bleed into the McCreary and Abby side of things, but there might still be a portion of it that is dedicated to these two. Clarke and Madi are both on the way to Eden, with their baggage really bringing down the Rover. Madi is now one with the flame, and nothing good will come out of that, with no one knowing that more than Clarke. She has already proved that she is massively freaked out by what Madi might potentially become now that she has all the Commanders in her mind. For now, though that is a thing, and it is something they both will have to figure out how to handle while they try to get to Eden. They don't seem to be in the rover in the promotional images, which could mean nothing or it could mean they had to ditch it because of those worm babies currently chilling in the back seat. Although, with this newly released clip, it is clear that tension starts to rise in the rover when Clarke makes a grab for the flame. Madi is not going to let Clarke get it though, which leads to the lovely reminder of what Clarke chose to do and who she was willing to lose. 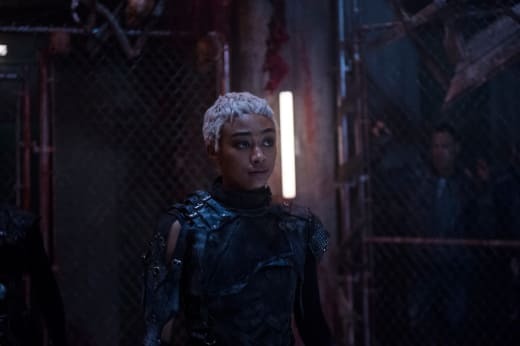 They both make decent points in this scene, with Madi being right when calling out Clarke about letting Bellamy and Indra and Gaia die. But also Clarke is right about Madi needing to stop trying to get to Polis because she isn't a Commander. Still, the two end up running into McCreary who has enough on his plate already. Chances are Clarke will have enough of the upper hand in the situation to be brought to Abby who is withdrawing from her pill battle now. The question of whether she reunites with the space group that is over with Charmaine and Kane remains to be answered. They have to reunite at some point, but that includes McCreary and Charmaine coming together, and that won't be happening as soon as one may hope. Which leaves plenty more unknowns in Clarke's case, all that is confirmed is that she sees her mother again and will be there to help through her withdrawal, although that really can't be the one thing she is doing for the next few episodes. 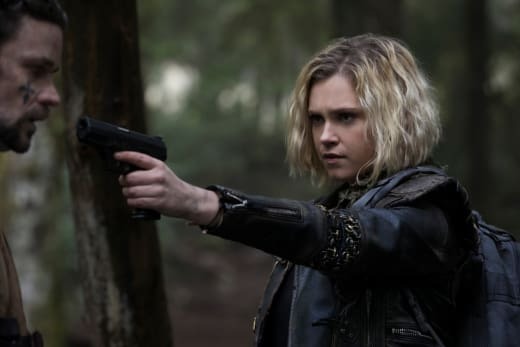 Abby will share with Clarke what happened during The Dark Year in the next episode, but for now, Clarke may have to also deal with the fact that peace won't be as easy as she imagined when she left everyone behind for the valley. 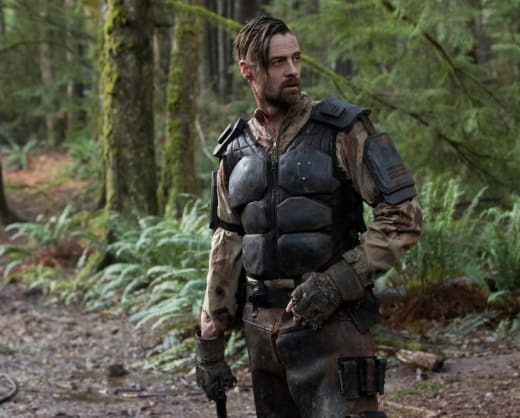 Now for them to possibly all make it work, first the groups within have to come back from Murphy's fire setting, and Clarke may also have to reveal what she did before she left to everyone else in the group. All of this doesn't even scratch the surface of Madi's new arc, the one where she is a Commander that can't be discovered by anyone from the bunker because then there will be the issue of her leading. They purposely ran away from something that now will force them to look over their shoulder, because Madi taking the flame doesn't end with the previous episode. This is just the beginning of Madi's story, and for now, that may include just learning to figure out how to get used to this new normal. Madi's random moments of channeling previous leaders won't end there, so gearing up for some surprises has to be a must. This is the obligatory request for more Pilot Mechanic because no one has made Raven smile like that in years and it is quality content. Those two are perfect, and their happiness is a light in a bleak part of Eden. Is there any way that flame will get removed from Madi? Is death the only option here? Who else is curious to see how characters like Miller will react to their own being put in the bunker. Frankly, Miller is just as invested in Bellamy and Indra as Octavia must be. His connection to them both means seeing them in the pits might signal something? Or this is all wishful thinking, and instead, he will happily recite the cannibal motto before watching with Jackson as all the action begins. If Clarke doesn't show remorse for the fact that she left her best friend and the two people that were on her side the most to die, I may riot. Mistakes were made all around, but Clarke's decision came from a place of anger, and there was no attempt to think of the people who were trying their best to think of her too. Just a thought. This is probably the worst thing to get from all this fighting pit drama, but the Bellamy and Indra content is already looking good. Sarcasm in the face of a looming uncertainty may not be the best setup for those two to interact more, but no one is complaining about the potential regardless. Don't forget The 100 is airing at a new time, Tuesdays at 8/7c on The CW. 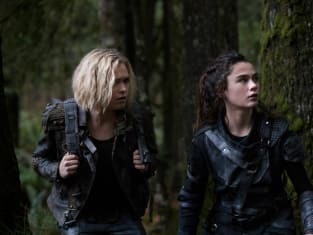 Stick around TV Fanatic for more episode previews and reviews of this upcoming season, and watch The 100 online if you need to catch up on the adventure.